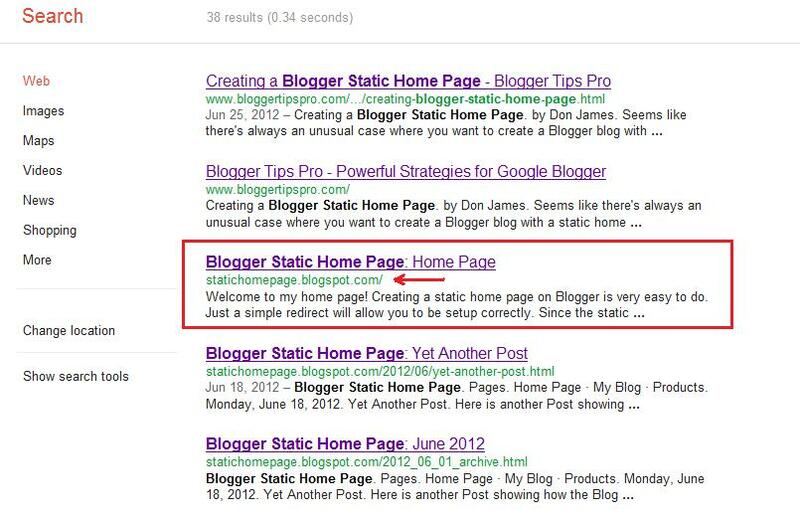 I thought I would add a quick update on how Google indexed my Blogger static home page. One of my main concerns was that Google might not like the Blogger page redirect in the search results. Frankly, it was difficult to tell just what kind of redirect Google was using. Note that the URL does not show the final redirected URL of http://statichomepage.blogspot.com/p/home-page.html - which is a good thing. From what I could see on the Google help pages and forums, this looks good for Blogger static home pages. Take a look at this response from a Google representative on 302 redirect behavior. To quote the representative from Google, "Generally speaking, with a 302 redirect we'd try to take the content of the redirect target (in your case PAGE-B) and index it under the redirecting URL (in your case PAGE-A). If the target has a noindex meta tag, then it's likely that we'd apply that to the redirecting URL as well." Hi Don James. this is a great tutorial. works perfectly. however, i just have 1 question. i already have an existing blog and i have people adding me on their blog list. if i were to change the front page to be the homepage and the one with index.html as my blog, do they still get updates from my blog? If people are subscribed to your blog via your RSS or Atom feed either directly through Blogger or Feedburner you shouldn't have a problem. Where you might run into trouble will be where people linked your blog URL on their site - they'll no longer hit your blog posts but the main page. Let me try a test and get back to you! Just wondering if you ever got a chance to test this out? I was also wondering about pinterest. If one of my blog posts was pinned months ago and I did this redirect so that I had a static home page would this affect the pins on pinterest that are already out there? I'm thinking not, if the pin was correctly pinned from the actual post and not the home page. Correct? Yes, that is correct. 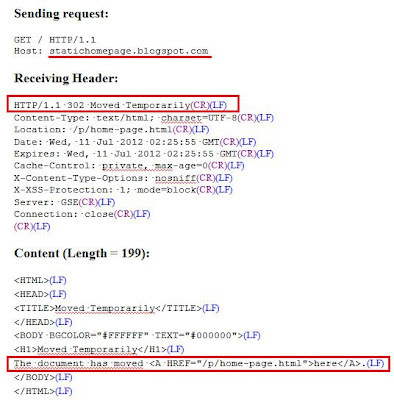 If the link is directly to the post the static page redirect will not have any impact. So if the redirected url is temporary (i guess there is no time limit for that?) and has no meta tag then then the meta-data of the index page will be used as if the static page was the index? Did I understand correctly? 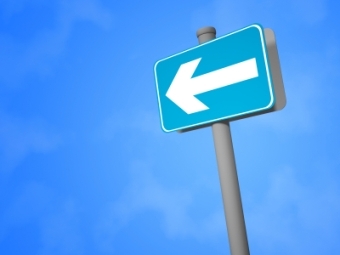 Thanks also for your great article with the walk through on how to set up the redirection to a static home page. That's a very good question. You can see from my screenshot example above that the page data was pulled from the static page and not the blog index page. As for the meta-data in meta tags, Google is looking at the full page semantics instead of those - so I don't think that data has much impact. Great tutorial! One question though. I want the blog page set up to open in a different tab/window. How do you do that under the page options? I was on vacation during your question - I'm not sure what you're asking. Can you give me some more details on your requirement? Yes, so under pages, when I add a new page there are two options: link to another webpage or title/blog page on the site. I am trying to add an old website (personal blog) and link it to my new site (offering services). However, when I add a new page (linking the personal blog) it leaves the service site completely. Do you have any ideas of how to link up two pages without leaving the first? Thanks for being a blogger problem solver! Because those are two separate websites, it won't "stay in the original site" per design. You can do 1 of 2 things: 1) load your old blog into a frame on your new site, which is not hard but does require coding skills. 2) Import your old blog into your new site so it is not at a different address anymore. This is the most elegant solution but you do lose any rankings you had with search engines etc. 3) Bonus idea: if your new site runs on WordPress, there are plugins that let you display the RSS feed from a different site. Thus, you'll have Blog page on your new site that will show all the content of your old blog on the page (but if you click on an individual post, it will still take you away from your new site to the old one. You can display the full post in the RSS feed which should keep most people from clicking on posts.) If you can't do #1 and is afraid of the implications of #2, this could be a good compromise for you. Hi Don, great post. Need some help. I am new to blogging. My blog is http://mustknowquotes.blogspot.com/. Success Quotes is a static page that is custom redirected to search based on label. I see that individual posts are indexed by google. But static page is not. I want static page also to be indexed so that person can directly land on collection of posts instead of individual post. Any tips? Thanks a lot in advance. That's a very good question on how Google interprets search result pages. Frankly, I'm now sure how they view those pages. What I see is not static pages but Blogger search results. I think you would be better off creating separate static pages with duplicated quotes and adding the right text for each type. I know that would be extra work - but, using search may not be the best. Thanks a lot Don. Appreciate you talking time to answer my (mustknowquotes.blogspot.com) question. Hi Don, An additional favor. If I populate staic pages, is there any way I can create separate menu for dynamic and static pages for my blog (mustknowquotes.blogspot.com)? Is there a easy way, any widget. Thanks in advance. When you create a Blogger tab menu bar for Pages you can point each tab to either a static page, or to any URL. I show an example in creating a static page by altering the tab menu to point to the main blog URL instead of a page. If you need dropdown menus then I would suggest using the Menucool.com code. I'll have a tutorial on that sometime soon. Yep - you found it. Using the /?m=1 will not work and creates a cascading effect. Unfortunately, there isn't a clean solution. One option is to turn off the mobile template for now, or, to check for mobile and have a hidden link only show on mobile devices that prompts users to click to the main page. Sorry! I'll keep looking for a solution. I found a creative workaround. I created two blogs. The first is my main one law.davidwhalen.com which consists of about 8 pages and only one blog post which acts as a static home page. One of the pages is a link called Law Blog and when you click it it redirects to my second blog on new sub domain called blog.davidwhalen.com. This is identical to the first blog except that it is a normal blog. All the pages are actually links back to the first blog pages. It works perfectly. My only problem is robots will probably show both blogs but it doesn't matter much since they are both so interconnected. Now when blogger adds the ?m=1 its not a problem. But Google should fix this by allowing the blogger to enter in settings a way to turn this off. Again thanks. This static page idea is great. You made me realize there might be another trick here. You might be able to fool the blog posting page to show only one widget if in mobile - but, then show all posts and hide that widget when clicking on the tabs. Complex - but it might work. Glad you found a work-around! I was having the same problem for the mobile issue. Do you think that could be a solution for having a home page and accessing to the blog with mobiles? Unfortunately, that doesn't work - it creates a circular reference that shows an error. i dont have much to say , i love the page i have been on all day and i have lean alot. thank you guys for the great job. Blogger counts my own page views. Is there any way to stop it? Sure! Just go into the Blogger main menu, choose Stats and find the link (it's a bit hidden) toward the center right of the page that says "Don't track your own pageviews". That will do it!! I did the same many a times. It simply does not work. Try a different browser to see if you cookies are somehow disabled on what you're using today. I am using Firefox, Internet Explorer and Google Chrome. I have gone to all these browsers and clicked "Dont't Track your own page views". Yet my page views are counted in all these browsers. On googling, I found the same problem is faced by so many other bloggers. Can you please look into this and help me please? Sorry to bother you Don James. I feel so dumb.... when i follow your instructions and then check the blog i get a "Sorry this page does not exist".... What am I doing wrong? Any solution for the mobile devices problem when "Creating a Blogger Static Home Page" yet? "...One option is to turn off the mobile template for now, or, to check for mobile and have a hidden link only show on mobile devices that prompts users to click to the main page. Sorry! I'll keep looking for a solution." I am not a code person but I have a couple questions about work-arounds. What is the best work-around as you see it? If you turn off the mobile template, does it still exist and can that be linked to? what is the code for hiding the link so that it appears clearly at the top of a mobile browser(with the mobile browser template turned on)? Thanks so much for your solid easy-to-use explanations! Nothing yet. My only options are 1) what you said about not using the mobile template or 2) create a duplicate blog with a new name (such myblog.blogspot.com as primary and myblog-mobile.blogspot.com as secondary). Then, have all the links in the mobile blog point back to the main blog (I have not tried this - so, there may be a flaw in my thinking)). I didn't understand your last question on hiding the link - which link is that? 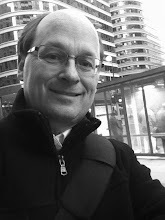 Thanks Don James, thinking...about the secondary duplicate mobile blog. "You made me realize there might be another trick here. You might be able to fool the blog posting page to show only one widget if in mobile - but, then show all posts and hide that widget when clicking on the tabs. Complex - but it might work." Were you implying hiding a link from desktops which shows up on mobile browsers there? If so, is there html for that? does this make your post in your "blog" section. invisible to serps? or would your post still rank in some keywords? Jon, all pages will be visible in the serps. That's purely ranking based on your post content and relevance. "If the target has a noindex meta tag, then it's likely that we'd apply that to the redirecting URL as well." I dont understand noindex issue. Should we use noindex for static page or another page? All I can say is ?????? From what I can figure out about blogs, they started out as text edited posts and got more out of control ever since. Even the simplest things take hours of reading help posts like this, and all take learning coding, HTML etc. Decades of point and click technology out the window. 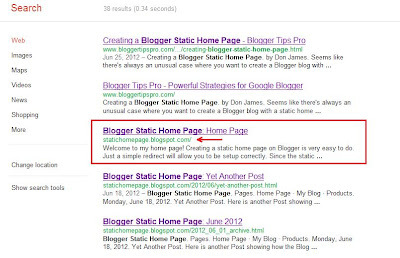 I'm using a static home page on a blog using your "Creating a Blogger Static Home Page" instructions. I have a menu with a "Home" choice that loads the static home page that uses the redirect. The issue is the Home button never gets the darker background that the other menu choices get they are clicked and their page is loaded. Is there a way to get the "Home" menu choice to use the same styling as the other menu choices? Hi Don, thank you for this. I am trying to build static homepage blog, but afraid about the SEO. I hope this is still working. Because I saw on URL that this article is posted on 2012. Thank you. Good to know it doesn't affect.Thanks James. So basicly all of the link juice from actual homepage "wont be transfered" to new one as this redirect is counted as 302 by google. So, is it safe if i continue to build backlink to original homepage ? Or should i build backlink to the new redirected page ? Wow amazing tutorial! I was about to delete all of my pages and start from scratch! Thank god I found this tutorial very grateful! This is a great tutorial, thank you! I'm playing around with making my own page, and I'm noticing an issue with the mobile template. Basically, if you disable the "Home" option in the Page gadget, it will disappear from the desktop; however, it will still appear in the tab/menu when viewing the page through the mobile view. So, for example, if you have created 3 pages (1 being the new, static home page) you will see the 3 pages in desktop mode. But, in mobile view, you will see 4: the three pages you used, as well as the original "Home" button that you deactivated!